This post is part of my at the table series, where I share stories and photographs that celebrate the men and women on the front lines of an inclusive, sustainable food system. 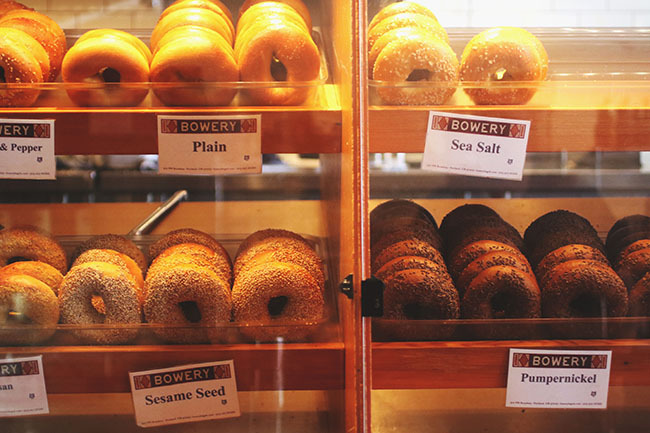 A small, unassuming storefront on NW Broadway in Portland, Oregon might not be the first place you think to look for a traditional New York bagel – but that’s exactly what Bowery Bagels delivers. Walk into their shop and you’ll find yourself transported to the Bowery Subway Station in NYC – complete with replica subway signs and tile – where owner Michael Madigan hopped the train to school each morning while growing up in New York. I met Michael one morning last fall over a cup of tea and a fresh Bowery bagel (spoiler alert: it was amazing) to talk food, business, sustainability, and the Bowery origin story. 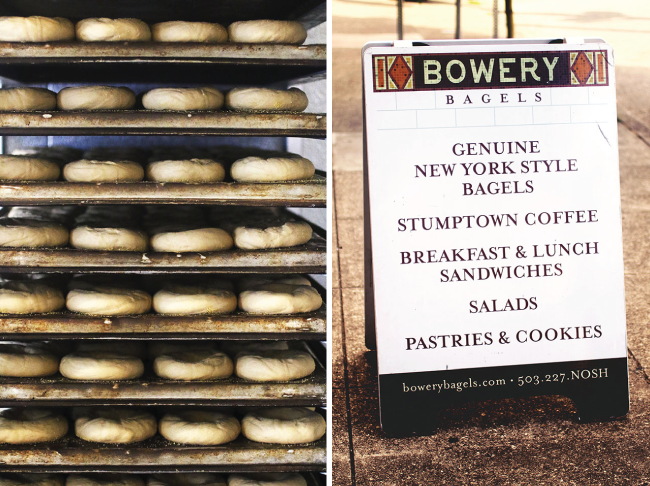 Bowery Bagels was born out of Michael’s craving for a real New York-style bagel – something Portland hadn’t been able to deliver since he’d moved there. “Enough was enough!” he said with a laugh when we talked. 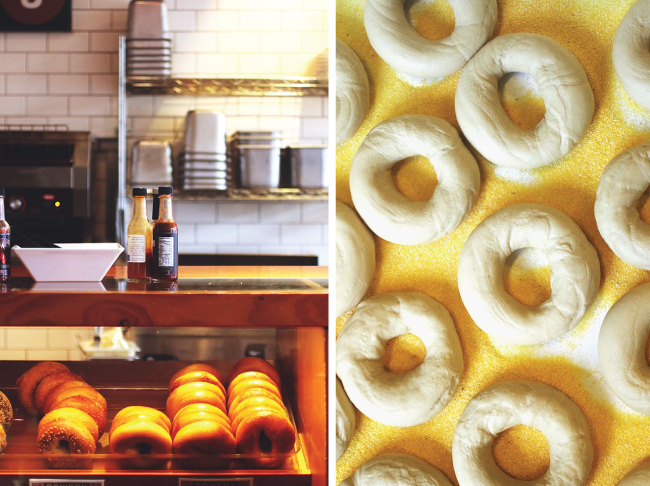 Portland needed an authentic New York bagel – even if it meant Michael had to start making them himself. So in 2012, Michael opened Bowery Bagels as a pop-up shop with just 180 bagels for sale. They were gone in 20 minutes. 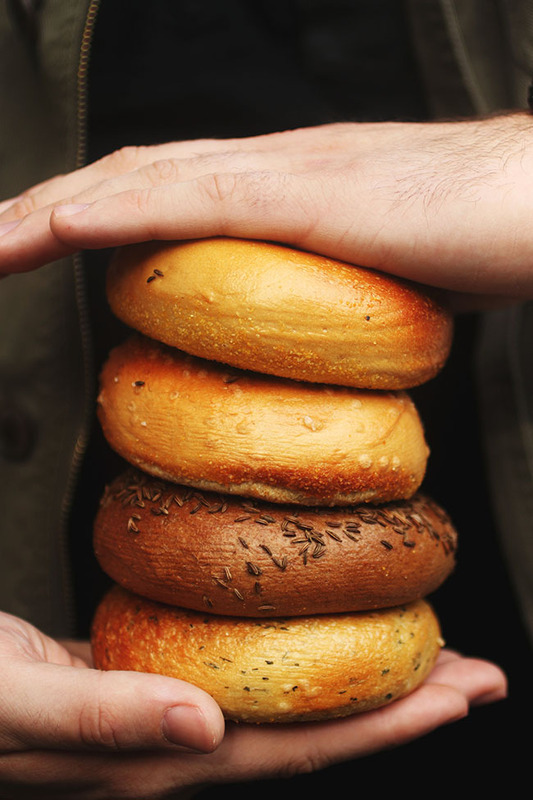 In the few years since their initial pop-up success, Bowery Bagels has scaled quickly. 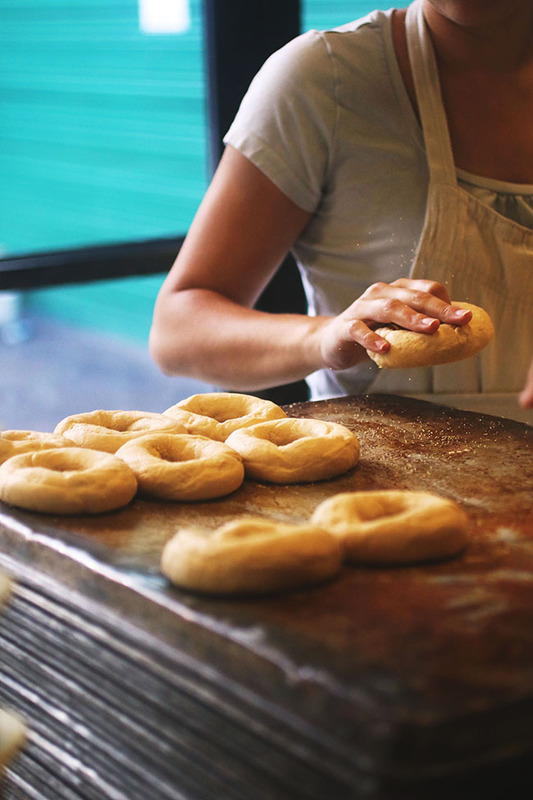 Today, they make 4,000 bagels a day for distribution both at their storefront and to restaurants around Portland – and they’re not slowing down anytime soon. 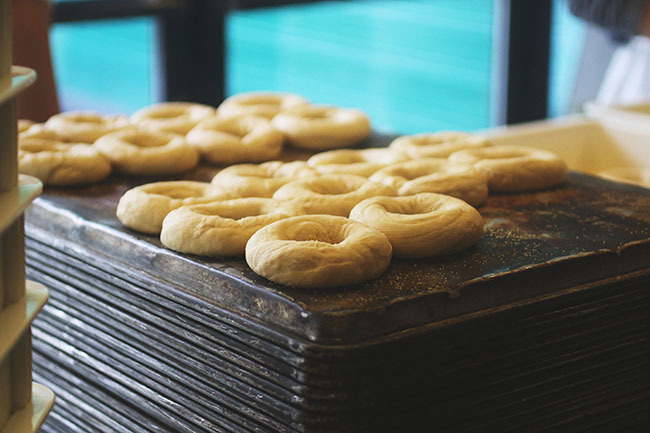 With a new, bigger production facility in the works, Michael has plans to expand production and distribution of their all-vegan, all-kosher bagel lineup in the Portland Metro area and beyond. Much of what they serve at Bowery Bagels – from the pastrami to the sauerkraut to the kimchi and, of course, the bagels – is made in-house. 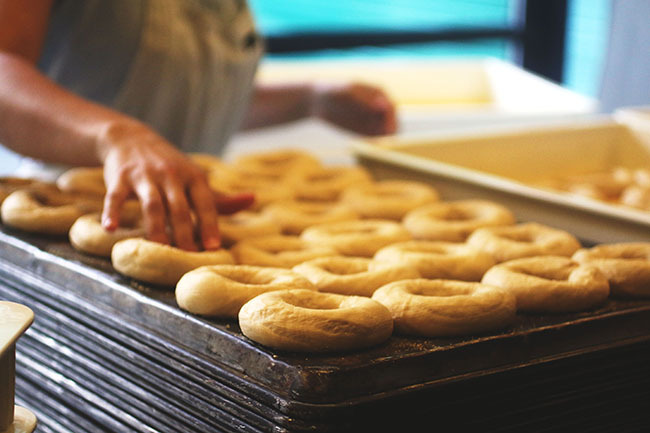 Their plain bagels are still made with Michael’s original recipe, and there’s an emphasis on quality even with production scaling up so rapidly. “We want [the bagels] to look and taste exactly like they did three years ago,” Michael told me. The Bowery storefront has more than a dozen bagel flavors available, and 11 varieties were available wholesale at the time of this interview. Locals will recognize the names of Bowery menu items as homages to early Portland residents. The Bowery Staff is also encouraged to develop their own unique bagel flavors – the weekend bagel specials, Michael tells me, are usually staff creations. 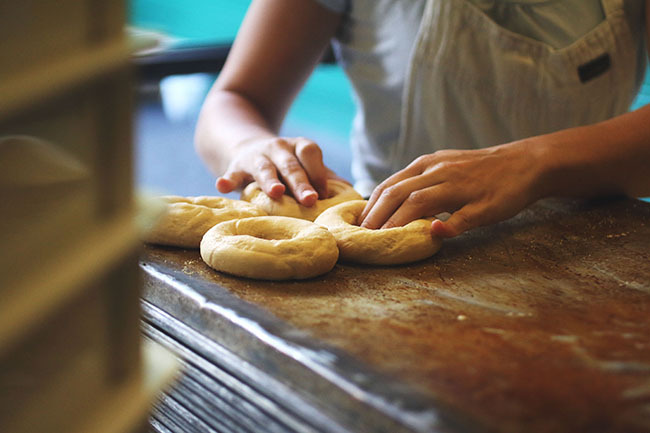 All of the bagels are hand rolled and hand stretched (as you’ll see in some of the photos below) and a special 2-day rise helps bakers achieve a traditional browned exterior without using preservatives or egg wash. Being preservative-free also means these bagels have a short shelf life, but this isn’t much of an issue since they’re just begging to be eaten as soon as they’re in your hands. Still, there’s more to Bowery than bagels. There’s a huge emphasis on traceability here. 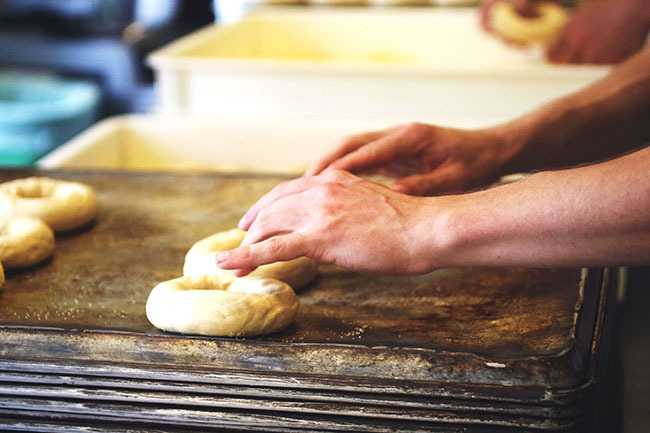 Michael can trace the flour in his bagels to the exact farmer who grew it, and each year he takes his team on a field trip of sorts to meet their farmers and learn firsthand about what goes into making each of their bagels. Another major piece of the Bowery Family is KitchenCru, Michael’s culinary incubator. KitchenCru provides space, equipment, and general business support to food entrepreneurs in Portland. Their facility, located across the street from Bowery Bagels, is a licensed commercial kitchen, and their members can rent space to produce their packaged artisan foods or prep food service. The facility provides everything a startup might need – from kitchen space to linens and onsite laundry, full kitchen equipment, and environmentally-friendly cleaning products. Michael’s team will even help entrepreneurs set up a website and get a foot in the door with local distributors and vendors. 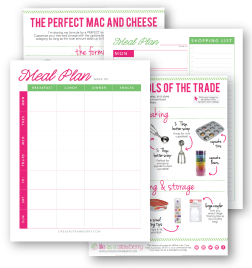 Members also have access to the KitchenCru suppliers – which, if you’ve worked in food service, you know can be a HUGE deal. Being a part of a bigger KitchenCru order helps startups avoid minimum order costs, as well as have access to local, sustainable, quality ingredients through the KitchenCru vendor connections. “The goal is to remove these barriers to entry,” Michael said as we walked through the KitchenCru facility, and help food startups build a successful business (you may recognize one of their alumni, a little company by the name of Jacobsen Salt). “I tell them to just bring their knives,” said Michael of his incubator members. A huge thank you to Michael of Bowery Bagels and KitchenCru for showing me around and for supporting an inclusive, sustainable food system! 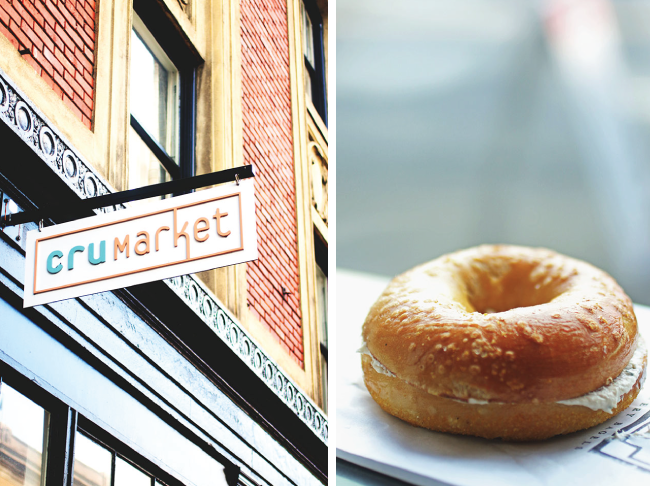 If you’re interested in trying Bowery Bagels for yourself, you can visit their storefront at 310 NW Broadway in Portland or pick up one of their bagels at select stores around the Portland Metro Area. For more information about the KitchenCru culinary incubator, click here.